The Gatwick Hotel in St Kilda is to close. A substantial house, Lockinge, was demolished and a luxurious private hotel was built in 1937. In Melbourne these were essentially boarding houses for the genteel. In the 1950s the hotel was bought by Maltese born Vittoria Carbone, or Queen Vicky, and she ran it until her death in 1998. Her two daughters, Rose and Yvette, inherited the hotel and took over the running. 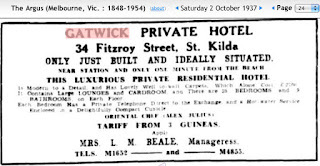 The hotel had become a place for the unfortunate to lodge very cheaply. Though R did once work with a chap who lived there for over forty years. He was very respectable and not at all poor. I wrote about him when he died and there is also some more about the Gatwick there. This photo from the ABC is Vittoria with her twin daughters who now run the hotel. The sisters are getting older and there has been extreme pressure for something to be done with the hotel. Politicians, local councillors, local businesses and police wanted it closed. At least daily, mostly more often, the police would have matters to sort out with one or more of the residents. There are 66 rooms within the hotel. 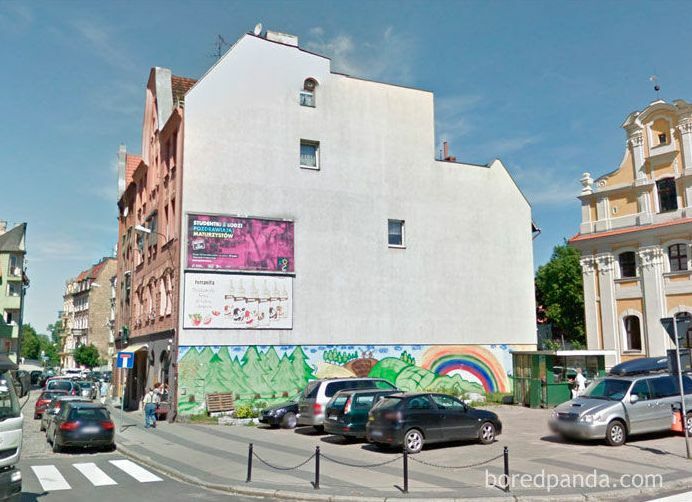 The sisters put the hotel on the market for $11 million but it failed to sell. 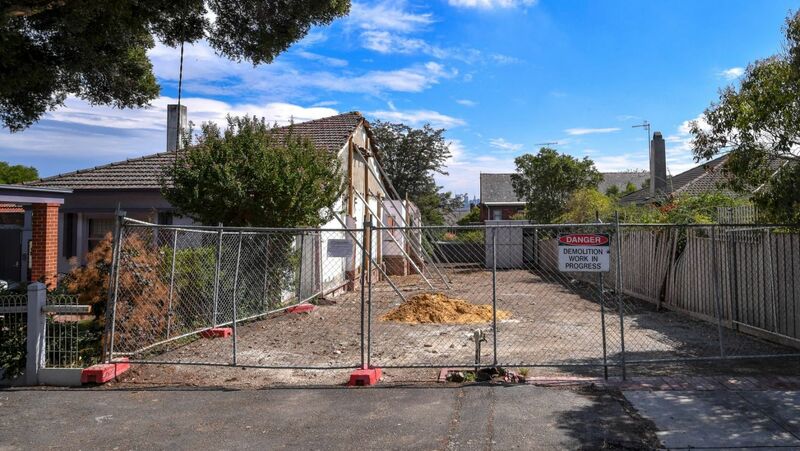 It did later sell, I assume for a price less than $11 million and the buyer was the Channel 9 tv station for a new series of their show, The Block. 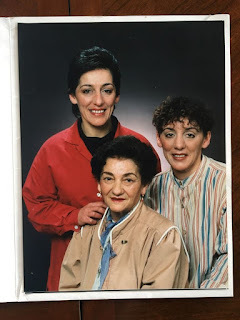 I hope this cutting but lovely and heartfelt goodbye from the sisters is quite readable. I am sure you know to click to enlarge. 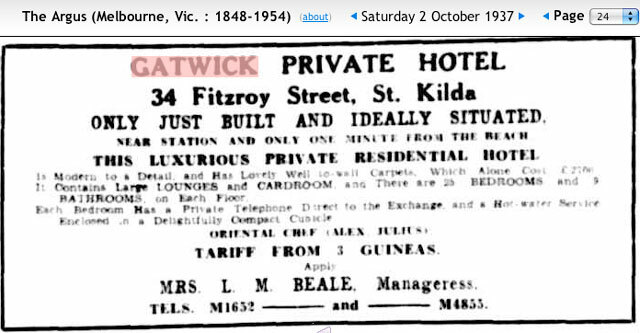 Later edit: It seems the hotel sold for around $15 million. It seems to have been a cold winter this year. Diane and myself have had an email exchange about Melbourne's weather, as she recently 'had' to visit Melbourne and she found it a little chilly. Perhaps she said, 'bloody freezing. 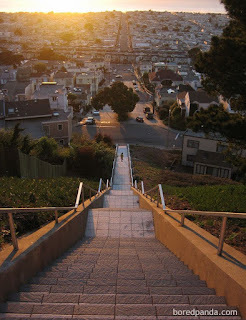 Why does anyone live there?'. For winter I put on a jacket over my shirt to go out into the cold. I am a bit of an oddity. You will find many people in Melbourne wearing coats and wrapped in scarves with a hat or beanie upon their tete. I am never outside for too long in the cold. But I know we are going to have a killer electric bill from our air con heating. At times I am a stingy Scot, but heating and cooling are not areas where I scrimp and save. A few years ago when staying at Sister and Bone Doctor's place, I took a light pullover and used it as they don't believe in heating and cooling. Well, minimal. It did not make much difference. I was still cold in their house. You will never be too cold or too hot in our home. Mother today, Thursday, told R that when she gets her granny flat in ABI Brother's back yard, she wants a gas heater to keep properly warm. She is not happy with her aircon heating. That would probably be because she sets it low and if she goes, out, she turns it off. Electric air con heating is the cheapest form of heating in Australia. Little Jo has celebrated her tenth birthday in the much warmer climes of Queensland. She has held up a large mango, snorkeled with pretty coral and fish and joined in the celebration for her great grandmother's 90th birthday, on Bone Doctor's side in one of those towns starting with T. Townsville? Toowoomba? I can't remember. It is near the sea, so must be Townsville. The 90 year old grandma of Bone Doctor just married for the umpteenth time about three years ago. She must be a bit of a card. I look forward to the goss about Bone Doctor's Super Gran on Sunday. Yes, Sunday. We are going to Anakie Fairy Park for a family celebration of Little Jo's birthday. We were present when Little Jo was asked what she wanted to do for her birthday and she said she wanted to go there. It was mentioned to Oldest Niece and she and Little M were thrilled at the idea. Sister and I discussed it and it was decided it was weather dependant. It is going to be gorgeous mostly sunny 12 degrees on Sunday and only a 20% chance of rain. That means a chance of a shower. We are going and Sister is providing a picnic lunch. We meet there at 10.30. This sort of thing has become all too hard for Mother. It is lucky if she has showered by 10.30, so she won't be there, and I guess not ABI Brother who normally brings her to social events. Tradie Brother hopes to attend. Oldest Niece and Little M and Little Em will be there, maybe her partner. Obviously Sister and Bone Doctor and birthday girl Little Jo. Firefighting Nephew will join us. Ex Sis in Law will come, with her husband. Not sure about Hippie Niece. She is now living at Ex Sis in Law's place, out of the mental health care ward where everyone was worse than she is. It is was so tragic to see the former bright, beautiful and gabby niece looking bloated, badly dressed, black ringed eyed and dead looking Hippie Niece. How did it all go so wrong? The easiest twin is being looked after by her dad, the Islander bloke and Ex Sis in Law and Oldest Niece are looking after the other twin in turn. I've been told there are eight beds in our State of Victoria for women with post natal depression. Six of them are practical for Hippie Niece. She is ninth on a wait list. So with some glee, I am informing Diane that is will be a lovely mostly sunny 12 degree day here in Melbourne on Sunday. Hmm, I might just find that pullover I used a few a years ago at Sister's and make sure it doesn't smell musty. Err, yes 12, that is a bit chilly. Say 54 for your Farenheit folk. Before we bashed off to Europe, we went to see the new twinnies in hospital, with niece Little Jo in tow. Upsettingly Little Jo only got to see them for a minute before she was booted out because she was a non sibling and less than 12 years old. Uncle R stayed with the twins, but the best place he could have been was outside to comfort Little Jo. I tried but I was inadequate. R has a special relationship with Little Jo. I'm the grumpy uncle. We then journeyed on to Royal Botanical Gardens of Victoria, the Cranbourne branch. If you find the more traditional type of English botanic gardens more interesting, perhaps this post might be more to your caring. Many years ago we saw the gardens at Cranbourne, shortly after it first opened to the public. We thought it was ok and had potential. And boy did it have potential. It is now officially fabulous. I won't say they are all Australian plants as I can't confirm that, but let us say mostly Australian plants. We arrived and found a car space quickly enough. We had some lunch at the cafe before setting forth. I think these are Sheoaks. Just for once, I will still my fingers and let the pictures tell most of the story. Little Jo seemed to enjoy herself. Part 2 soon. The colours of our Australian outback. This Boab or bottle tree stores water within its trunk for long term desert survival. I'll break here only because it is half of the photos. 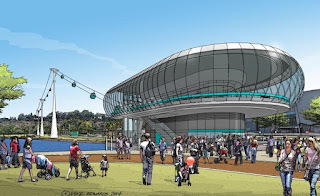 I expect they would come and a chairlift running in Perth from Elizabeth Quay to Kings Park would be very successful and profitable. But how do people in Perth feel about it? Grace and Sami, state your views. I will guess that lovers of Kings Park are horrified at the thought (confirmed), lovers of Elizabeth Quay, less so. Kings Park is an absolute delight. It sits up above the City of Perth at its south eastern corner. As you can see in my photo, the park offers great views of Perth. As a stand alone park, it is also wonderful, with the main ceremonial war memorial within its borders. A proposed route for the chairlift runs from the quay to the eastern end of the park and then south west through the length of the park, with two boarding and alighting points within the park, as well as the park terminal. It would certainly be useful to get about the park and travel directly to the park from the quay. 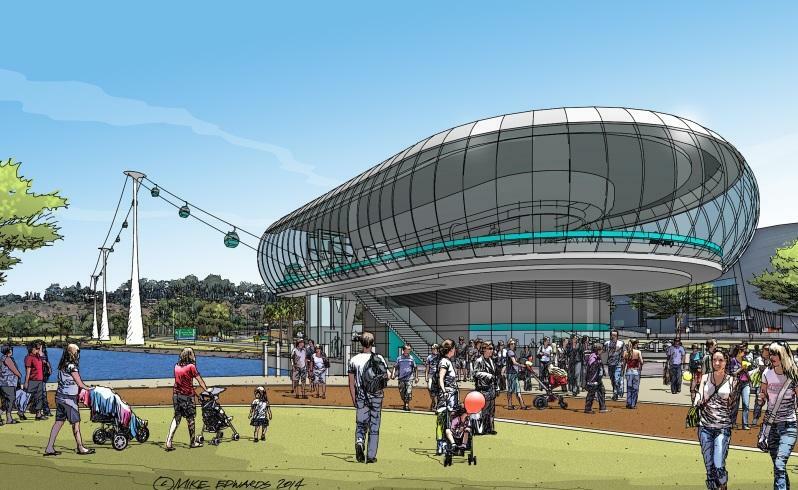 Here is a picture of what the Elizabeth Quay terminal might look like, from The West Australian newspaper. 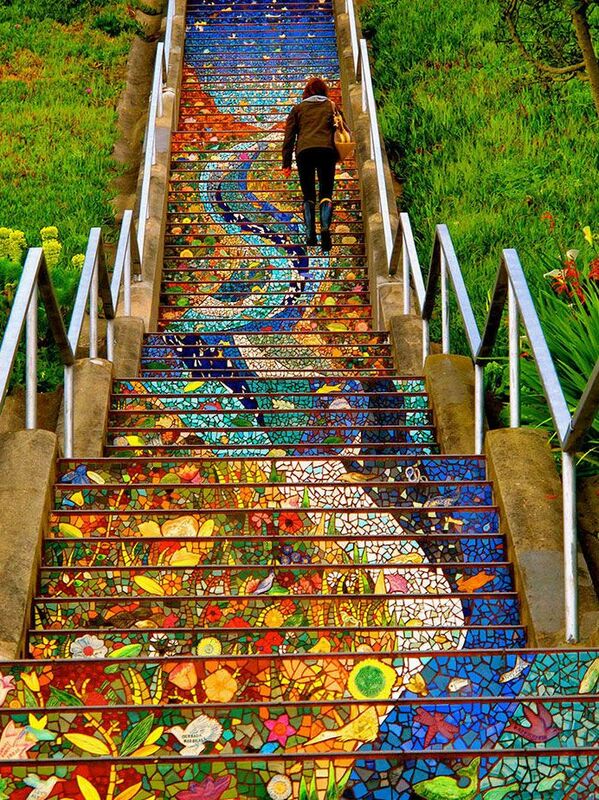 Pretty ghastly, really, and if the artist's impression is bad, imagine the real thing. I initially liked the idea but I have changed my mind. The impact of the stations in the park would be too much. If there could be a minimal and discreet terminus on the eastern edge of the park, maybe, and with minimalist pylons. Thinking further does the view from Kings Park towards the city really need pods floating across the skyline? I think not. But as I said, it would be very successful. Err, so was leaded petrol and asbestos. Although these are the same stairs, they are quite different photos. 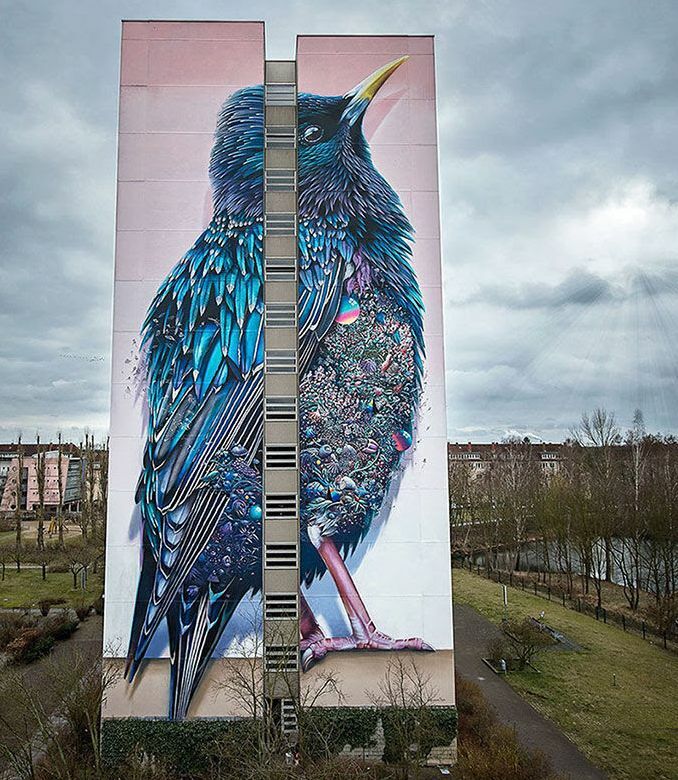 I guess the second had to be a closer shot to pick up the detail. 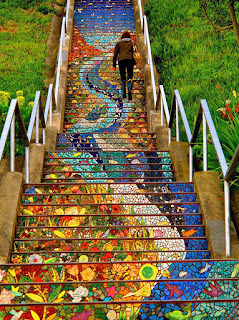 Tiled steps, 16th Avenue, San Francisco (no credit given). This house is amazing. How can it not be a three dimensional work? 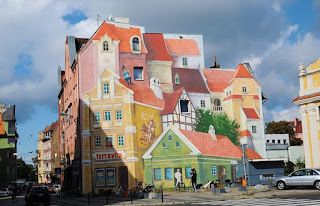 It reminds me of how buildings are put together on the steep hills of Lisbon and Porto. Poznan, Poland by Waldemar Wylegalski. 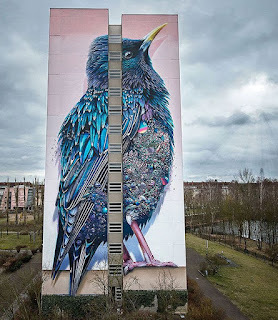 Starling, Berlin, Germany by Nika Kramer. 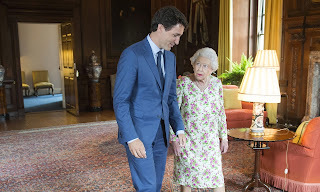 Assuming these photos from the wonderful The Guardian are in order, and I think they are, Canadian PM Jussy did not buy a new suit to meet Her Maj. The Chancellor of the Exchequer has increased her funding. No longer will she have to cut up her curtains to sew up into dresses. Closely looking at this photo, I see Jussy has quite a decent sized nose. Side profile is not his best angle. Of course we all know a big nose means......big feet too. So, think freely, widely and with humour for a caption for the photo below. Has Her Maj asked Jussy a question and he is replying in an interesting manner. Is she about say, 'Really, Jussy. Get a grip' Is she thinking, you are a bit more handsome than your father, Pierre, and have much better hair. Maybe she is about to say, I simply won't talk to you about Trumpet. 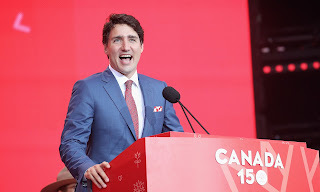 Maybe he is saying, 'My stylishness and gay friendly persona comes from my mother. Did you know, Ma'me, that she used to party with a lot of gays in New York?' I don't think anyone in Britain or her colonies has been done for lèse-majesté for decades. Take a chance, walk on the wild side and say your worst. Quite an extraordinary photo, is it not. 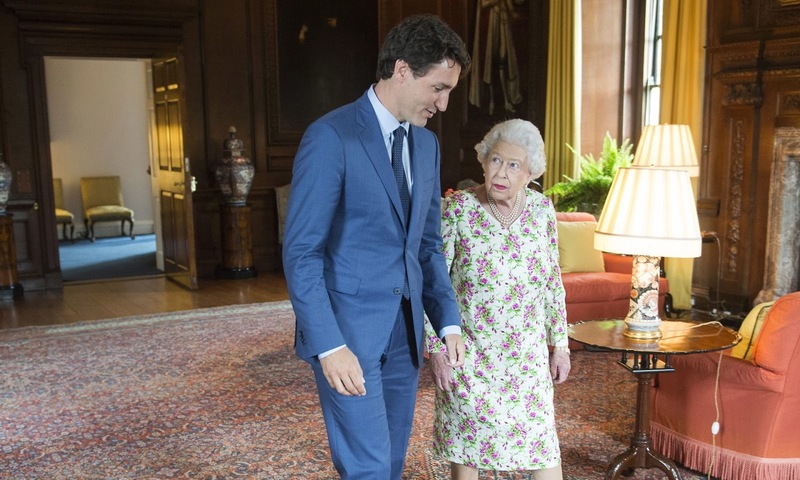 Her Maj has seen so many Prime Ministers come and go in her colonies. A modest Sunday Selections today. River and others will join in. 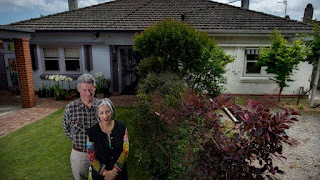 The details are hazy now but this couple live in one of a pair of houses in Kew and I am sure they did not want the other house demolished, but it was. God knows what will be built next to them. Photos from The Age. I suppose a two storey house could be adjoined to the remaining house with some sympathy, but I really doubt that will happen. 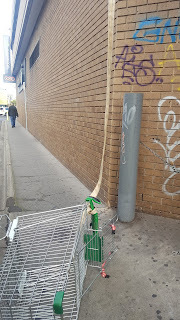 The side of our local supermarket. The strapping went right up to the carpark above. Was the trolley lowered down, and if so, why? It looks like some sort of prank to me. 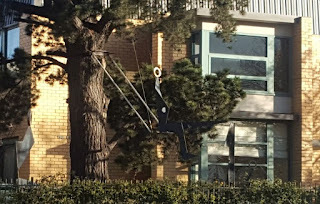 It is a bit hard to see, but I like this sculpture of someone swinging in a tree at an aged care home. The top level balconies of our building have drainage of what we call spitters. The rain water drains from the balconies out these pipes, and in heavy rain it really shoots out, and breaks up into small droplets before it hits the ground. 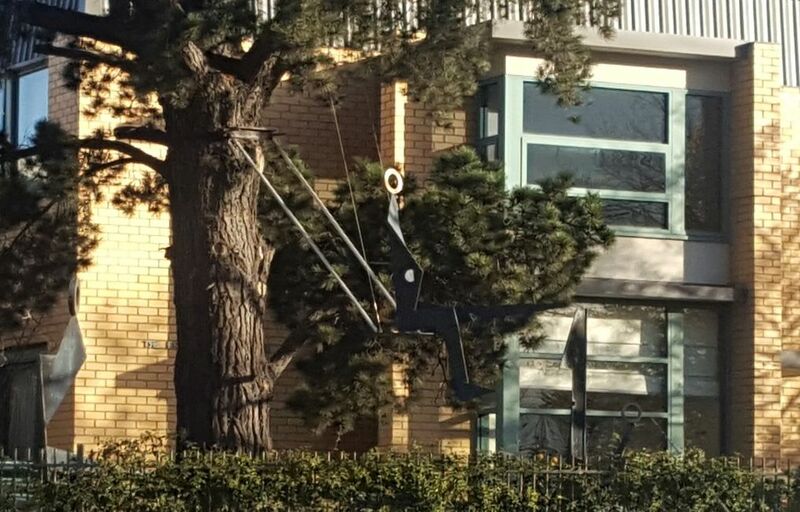 Their installation in new buildings is now illegal and they do cause problems, such as us getting a shower on our balcony if a gust of wind blows our way. Downpipe is being installed by a combination of plumbers and abseilers. You can see brackets have been installed. 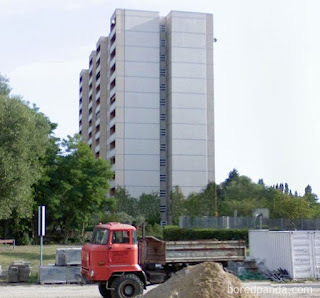 Only two levels in the building have these concrete balconies. I do not know why. They are so ugly. The other is much lower. A hole has been drilled for a pipe to connect to the downpipe. I thought this was a good idea, directional stickers on the footpaths while the tram service is disrupted by the works below. I like this little bit of window decoration at the City Library. Unlike the State Library, this is a lending library operated by the City of Melbourne and it is extremely popular. Last time I was there, I repeat extremely popular. City of Melbourne operates other libraries within its boundary and I have shown them to you in the past. They are all successful. Libraries will not die but just reinvent themselves. This is good.